BentoBeginner of http://bentoforbeginners.blogspot.com/, lover of cute shaped onigiri, picked the same number as the random generator so she is the recipient of the free book! Congratulations BentoBeginner! If you could please email me your mailing address (my email is jackisbentoATgmail.com), I will see that it gets to you. I have to say that I was really touched by how many of you said you were happy to see me back. I want to apologize for not posting more frequently. This has been a year full of changes for me and making bento lunches kind of fell off my radar for a bit, mainly because I took quite a bit of time of work so there was no need to pack lunches. BF and I decided we needed a fresh start so we tossed all of our stuff in a U-haul and drove for two days until we hit Toronto. That was two months ago, and for the first month I barely had a kitchen to cook in! I seriously suffered from cute food withdrawl, although it was a good opportunity to explore the cupcake shops in my new neighbourhood. I'm back at work now, and while I do expect I will pack a lunch sometimes, I'm in a fortunate position where I'm able to come home for lunch, so I'm not sure yet whether I will be able to update as often as I used to. But on the plus side, there are much better resources where I'm living now for different ethnic foods, which I find so exciting! Although I'm still trying to locate a place to buy bento supplies in Toronto. If you have any leads, let me know! So that's where I'm at right now. This weekend I'm hosting Thanksgiving dinner (My first turkey! Eep!) so I will be putting together a batch of turkey cupcakes. On one of his many travels, BF found me a bottle of root beer extract, so I'm going to try to make root beer cupcakes! I'm pretty excited by this prospect. If they turn out any good, I will share the recipe for sure! 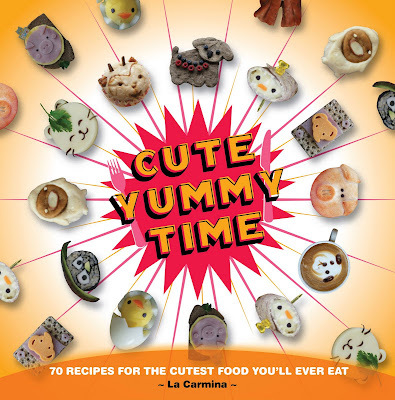 La Carmina, author of the new book Cute Yummy Time, offered to send me a copy of her book to review. I love any opportunity to check out some new, cute foods so I was happy to oblige, but I couldn't forget about you guys! So I asked if she would send a copy to one of you as well and she said sure! Here is my review, and at the bottom of this post are the instructions for what you need to do to enter the very first giveaway contest here at Jacki's Bento Blog. I love that the art of the bento lunch is becoming more and more popular here in North America because as anything grows in popularity, more information becomes available on the subject. When I started making bento lunches about two years ago, it felt like although there were great English books available about Japanese cooking, and even specifically with bento recipes, all of the kawaii bento books were in Japanese. To find the really cute stuff, I resorted to attempting to mimic things I saw on Japanese language blogs. But it seems that over the past few years, more and more books have been entering the North American market that specifically focus on the cute, artistic elements of bento lunches. While this is a good thing, most of the ones I have read have had lots of great artwork, but not the clear instruction I was looking for, this is the niche that Cute Yummy Time attempts to fill. The book contains 70 recipes for cute foods. Each has its own two page spread that contains an ingredient list, detailed instructions and coloured photographs. Although the pictures only show the end result (there are no step by step pictures), after reading through this book I feel confident that I can recreate any of the recipes and designs. They all seem really straight forward and use ingredients that I can pick up at my regular chain grocery store, no trip to the Asian grocery store is necessary. I believe the author is a very creative person as there are ideas in here that I've never seen before, and I spend a lot of time looking at people's pictures of bento lunches! There are little things I never thought of, like using my nori punches to make shapes out of spinach, and there are lots of foods I've never thought of trying to make cute before (I can't wait to try her recipe for piggy bread!). Some of the recipes are very clever, like her Puffin Sushi, a maki sushi roll where the slices look like puffin heads. The healthiness of all of the recipes really impressed me. She uses whole grains, high antioxidant foods, low fat dairy products, natural sweeteners and lots of fresh produce in her recipes. The recipes are all from scratch, right down to things like doughs and soups. The meals are smartly balanced, for example her recipe for Panda Tofu Soba. It has lots of lean protein in the tofu, soba noodles for carbs and lots of brightly coloured, fresh vegetables. It's perfectly healthy and balanced meal, and it's just adorable. That said, half of the book, called the "To Go" section, contains recipes that are not portable and therefore not suitable for bento lunches, although you will find lots of great ways to make a cute breakfast. Many of them also require special bento equipment such as animal shaped cutters, and ice cream sandwich molds. A lot of people have these already, but I know there are also those who have a hard time getting ahold of these things. My only criticism of the book is that for a few of the recipes, it's difficult to identify exactly what animal I'm looking at. I was excited to see a recipe for Hedge Pork Loin because I adore hedgehogs. When I saw the picture, however, it didn't really look like a hedgehog to me, so I won't be making it. But some of them, like the Polar Bear meringues, are spot on. All in all, I like the book and will definitely be trying some recipes from it. It's well put together, easy to understand and none of the recipes appear to be overly complicated or time consuming. Everything looks yummy and they will definitely add some cuteness to our meals. Book Giveaway Contest Rules: To enter, leave a comment on this post that tells me your favorite cute food to pack in your lunch. Mine? Checkerboard cut apple slices. The cutoff is Midnight (Eastern Time) on Thursday, October 8th. On Friday, I will select a winner using a random number generator. So if the random number generator picks 6 and your comment is the sixth one, you win! I suggest that you include a way for me to contact you in your comment (for example, through your blogger account if you have one or by posting your email address). Otherwise, I will post the name of the winner on my blog next Friday and they can contact me through my email address which I will post at that time as well.